Those of us who save the dry skins of onions to boil in water for 'natural' Easter eggs, may have learned to do it from our grandmothers. A century and a half ago, instructions and even a picture of an etched egg, were in books. Incidentally, during a visit to the area before Easter, I saw bags of onion skins for sale in a Lancaster grocery store. A very pretty Easter gift is a boiled colored egg, on which, as on colored porcelain, the most various designs, monograms, pictures and the like, may be etched with a fine penknife. As hard-boiled eggs do not decompose, this forms a durable mark of remembrance. The brown color on our model, is produced by boiling the egg in water filled with onion peels. Hard boiled Pasch eggs are to be found at Easter in different parts of the kingdom. A Liverpool gentleman informs the editor, that in that town and neighbourhood they are still common, and called paste eggs. 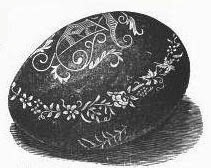 One of his children brought to him a paste egg at Easter, 1824, beautifully mottled with brown. It had been purposely prepared for the child by the servant, by being boiled hard within the coat of an onion, which imparted to the shell the admired colour. Hard boiling is a chief requisite in preparing the patch egg.